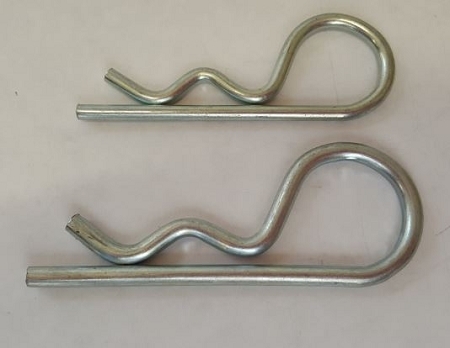 Home > Trailer Pins, Assorted > Keeper Clip "Hair Pin"
MEDIUM: 3" long X 5/36" keeper clip is commonly used to slide through the hole on an Atwood-type sliding coupler latch handle. It also fits through the hole on the end of some 5/8" or 1/2" hitch pins, to secure it. LARGE: 3 1/4" long X 3/16' keeper clip fits over the groove on the end of the 5/8" or 1/2" hitch pin to secure it. To attach these keeper clips to trailer, see LANYARDS sold below.